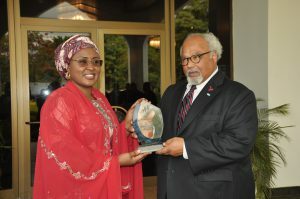 Nigeria’s First Lady hailed as National Champion for TB Control at high-profile national TB conference in Abuja. Dr. Maarten van Cleeff at the National TB conference: “We need an integration of services”. 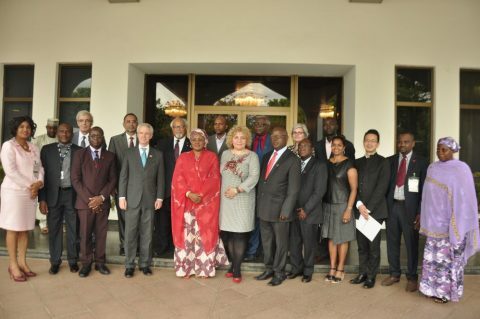 TB control in Nigeria was in the spotlights last week: at the recent national conference on TB control, the First Lady of Nigeria Mrs. Aisha Muhammadu Buhari reaffirmed her commitment as Nigeria’s Champion for TB Control. The conference on 17 and 18 May 2016 also had significant international appeal with the attendance of, among others, UN Special TB Envoy Dr. Eric Goosby and Stop TB Partnership Executive Secretary Dr. Lucica Ditiu. 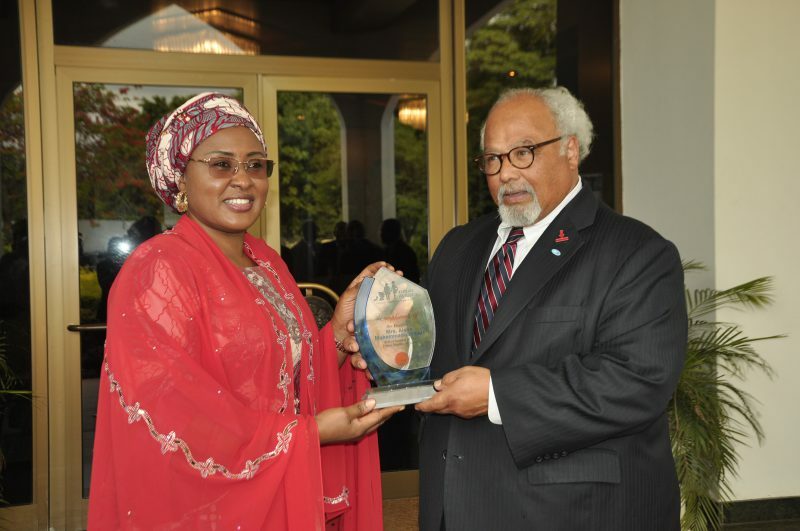 First Lady of Nigeria, Mrs. Aisha Muhammadu Buhari with Dr. Eric Goosby, UN Special Envoy for TB. The attendance at the conference shows the high level of support that there is for Nigeria’s ambitious drive to eradicate TB: Prof. Isaac Adewole, the Minister of Health attended, as did Mr. Michael Harvey, USAID Mission Director to Nigeria, Dr. Rui Gama Vas, WHO Representative to Nigeria and members of the Board of the Nigerian Stop TB Partnership, and Challenge TB Country Director/KNCV Representative Dr. Mustapha Gidado. There were six international guest speakers, over 1000 participants attended, including parliamentarians from at least five states; and 28 scientific papers were presented. At the conference’s opening session, KNCV’s Dr. Maarten van Cleeff, Director of Challenge TB, described the TB challenges facing the entire sub-Saharan continent, as well as those being addressed in Nigeria. Maarten van Cleeff spoke of the need to find ways to reach the so-called ‘missing cases’, because not enough infectious TB patients are being found and put on treatment. Consequently, too many people are still dying of TB: 248,000 per year, almost 27 per hour or one death every 2 minutes in Nigeria. A major challenge is to reach the people because of low awareness to TB, weak health care delivery system, minimal engagement of the private sector, and weak diagnostic network across Nigeria. A second challenge that Nigeria is facing is that of TB drug-resistance. Around 3,300 multidrug-resistant TB (MDR-TB) cases are among the notified TB cases annually. But 18,000 MDR-TB cases are not found. Once diagnosed, the treatment of MDR-TB patients is not simple and requires vigorous monitoring of side effects, clinical care, and socio-economic support to patients. “We really have a problem here in terms of the health system’s ability to care for these patients properly”, said Dr. van Cleeff. A third challenge for Nigeria is the development of new service delivery models to ensure more integrated services for HIV and TB. Through the Challenge TB project we are supporting activities in fifteen states to help to expand TB services, especially diagnostic and treatment in high-population density areas and underserved areas. For example, the government is currently reactivating over 10,000 Primary Healthcare (PHC) facilities to bring affordable and quality healthcare to the population and an integration of TB and HIV services. Challenge TB and other partners wish to collaborate with the National Primary Health Care Agency to ensure effective integration of TB & HIV services in the process. By mobilizing a wide range of stakeholders we aim to generate the necessary momentum for a high-level domestic commitment to end TB in Nigeria. Read more about KNCV’s activities in Nigeria.